The most any studio has done to open up a complex genre to a new audience. Inviting, entertaining, and deceptively deep. What Is It? Accessible lane-pushing game starring a variety of Blizzard characters. Heroes of the Storm is not just another MOBA. It's a comment on the MOBA by the company whose games inspired the genre. With it, Blizzard step into territory that is both deeply familiar and deeply alien to them: a world of chunky characters and competitive strategy that they embrace alongside a world of fathomless homebrew complexity that they don't. This is a studio that has always valorised accessibility and has lately had that belief galvanised by the striking success of Hearthstone. Heroes of the Storm is a MOBA for people who don't play MOBAs, therefore—perhaps even a MOBA for people who don't like MOBAs. It'll be divisive for that reason, I suspect. In designing Heroes of the Storm, Blizzard have stripped away many of the ideas that previously defined the genre. Individual leveling is gone, replaced with a team-wide experience bar. Gold is gone, and with it items that boost your character's powers. Strategic drafting is gone, at least until you complete the long climb to competitive ranked play: for the majority of players, Heroes of the Storm is a game where you pick who you want to play, click 'Play', and play. Doing so places you in a team of five fantasy heroes drawn from Blizzard's wide roster. Victory means pushing AI-controlled creeps from one side of the map to another along linear lanes. This means passing through the gateways, towers and fortresses that amount to your opponent's outer defenses, and when one team's core falls the game is over. Here the comparisons to other MOBAs end. Heroes of the Storm has seven maps at present, and each of these offers a different layout and a different set of objectives. In Sky Temple, capturing shrines and defeating guardians grants your team the assistance of a building-felling laser weapon. In Blackheart's Bay, collecting coins for a ghostly pirate allows you to turn his cannons on your enemy. In Haunted Mines, the whole bottom level of the map—the titular mines—amount to a side-dungeon where you gather undead skulls to power up your team's hulking golem. Diverse as individual objectives are, they amount to the same thing: a reason to leave your lane and fight elsewhere. Sit in one place clicking minions and you'll find yourself quickly overwhelmed as your opponent takes control of the map, and with it the neutral monsters and bosses that can be defeated and recruited to join one side or the other. All heroes begin with three abilities alongside a passive power (although these sometimes have an active component) and earn an ultimate when their team reaches level ten. Heroes of the Storm often feels like entering a Dota 2 match in the middle, and within a fifteen minutes you can be playing out battle scenarios that would amount to the endgame of a fifty-minute epic elsewhere. These scenarios are likely thanks to a generous number of comeback systems. Games rarely feel lost within the first few minutes—although this doesn't stop a certain section of the game's community from angrily abandoning matches after an early setback. Teams that are behind receive bonus experience, and the plurality of optional objectives means that there is almost always something you can do to turn your fortunes around—you just need to figure out what it is. These decisions make Heroes of the Storm the most accessible MOBA I have ever played. They amount to a striking simplification of the genre's vocabulary, boiling the most opaque sector of competitive gaming to a handful of verbs: attack, defend, capture, collect. With this, it opens up the basic strategic pleasure of five-on-five fantasy battle to an audience that might never have otherwise tried it. Coming to Heroes of the Storm as somebody who is already heavily invested in this genre, I've found my attitude continually shift. There are times when I've felt like a rally driver on a go-kart track. In these moments I've yearned for a game where failure is more significant and victories mean more, where I can make use of the entire secret language these games have taught me rather than a small part of it. I suspect this will be the experience of many existing MOBA players, and that the more cynical of these will write Heroes of the Storm off entirely. I don't think that's fair. As much as Heroes of the Storm truncates the genre, it preserves strategic concepts that are more advanced than those that have been removed. Items, skill builds and so on are all knowledge barriers: with a bit of perseverance, every player will eventually move past them. In knocking down that barrier, Blizzard have created a game that is entirely about map control, timing, momentum, and combat finesse. These are things that take time to fully internalise, a set of learnings that only come with experience. One of the ironies of Heroes of the Storm's accessibility is that, in removing the obvious impediments, it drops new players right in the strategic deep end. Given the amount going on in any given map and the apparent 'looseness' of the laning system, it's easy to lose matches quickly and not really know why. Play Heroes purely as a 'hero brawler'—Blizzard's preferred term—and you'll find yourself outmaneuvered by players who understand that there's a time to fight, a time to hide, a time to sweep the map for objectives. These considerations are just as compelling as 'what item do I build next'. 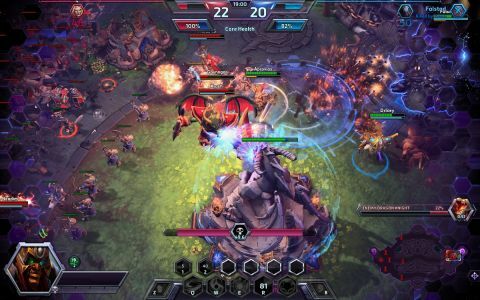 Heroes of the Storm loses out in terms of systemic complexity and the creative potential that comes with it, but does an impressive job of introducing new players to the map-wide strategic element that makes these games so compelling to watch and play. Where the game stumbles, it doesn't stumble because it's accessible. Although the feel of the game has improved since I first played it at Blizzcon 2013, Heroes of the Storm doesn't match the high standard that Blizzard have set elsewhere. This is particularly apparent in the case of the Diablo heroes—in their original incarnations, these are defined by the damage they dish out, by the sense of force imparted with every click. In Heroes of the Storm, that edge has been stripped away. What would be a bone-crushing slam in Diablo 3 becomes a weedy thump here. Heroes of the Storm's avatars occupy far more screen-space than their equivalents in League or Dota, and combined with much smaller maps this gives the sense of being a bigger kid in a smaller sandpit. On the other hand, abilities feel rather muted: stuns are short, damage is low, particle effects simple and brief. These two factors contribute to the sense that your individual power is limited. I don't believe that Heroes of the Storm lives up to the best of Blizzard's visual work, either. These games have always looked like a teenager's sketchbook given life, but now it feels like that sketchbook has been through the corporate photocopier one too many times. Blizzard's latter-day love affair with PopCap is evident in the little details—like the way that turrets and gates screw themselves into place, Game of Thrones intro-style, at the start of every match—but this doesn't make up for the general lack of atmosphere. The StarCraft, WarCraft and Diablo universes, when seen through the same technicolour filter, lose their distinctiveness. It is also, at present, a little too eager for both your time and your money. Although the worst excesses of account-wide levelling were excised during the beta, you still need to grind away to unlock every talent and skill for every character, and if you want to play outside of the rotation of free heroes then you're looking a week of running daily quests every day in order to save up enough gold for one or two characters of your own. Unlocking ranked play takes about 40 hours—double that if you're not using a premium booster—and this feels like a misstep in a game that otherwise doesn't provide you with many ways to gauge your growth as a player. I feel comfortable recommending Heroes of the Storm despite these issues. In some ways, I feel more comfortable recommending it than I do Dota 2, a game I have committed a substantial amount of my time to. This is because Blizzard has created a MOBA that doesn't require you to commit your life, or even an entire week, to get something out of it. The benefit for newcomers is obvious. The benefit for existing MOBA players is more subtle: we finally have a fit ambassador for our genre. Heroes of the Storm may be divisive, but I hope it isn't. I hope that this is the game that shows people who don't like MOBAs what they're missing.